In my years as both a bookseller and as a reader, I have discovered a most interesting and delightful phenomenon – books find us. The book you are meant to find will call to you, like dark chocolate peanut M&M’s and HGTV. I no longer work in a bookstore and thus have fewer opportunities to flip through publisher catalogues and fondle freshly unpacked new releases in the shipping department, but the books I am supposed to find will still find me, or so I tell myself. As for the books that are recommended by well-meaning friends and reviewers, well…I try to be nice. It’s that subjective thing. One person’s beautifully illustrated book is another person’s piece of sentimental schlock. I am the first to admit I am a tough customer. At the end of December, I was wandering around a local independent bookstore and I decided to have a quick look in the children’s section. I was unimpressed with the Christmas books for 2009, and wasn’t expecting to find anything to amuse my senses. But Waiting for Winter was waiting for me in the Staff Selections section. I picked it up and had one of ‘those’ experiences: my knees turned to rubber, or a rubber-like substance. My body was telling me to take this book home. I flipped no further, not wanting to spoil what promised to be hours of delight, but rather than hours, I got minutes, but not an inconsequential number of minutes. This is a book to be devoured, each page a binge of line gone haywire and colours tuned to the last days of autumn. 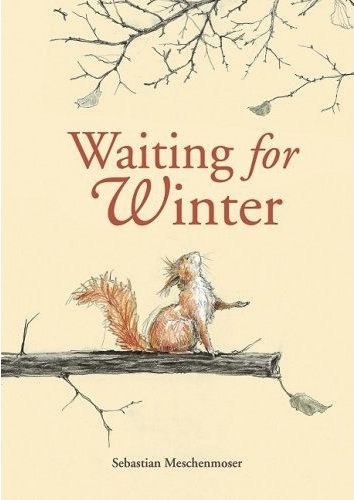 Not surprisingly, Waiting for Winter is by a German illustrator, Sebastian Meschenmoser. There is little biographical material available other than he lives in Frankfurt and is quite young, only 30. Europeans have a way of meshing simplicity with beauty. Lisbeth Zwerger, an Austrian, is the gold standard of this style of illustration. There is glorious detail in her work, but no clutter. Each line and stroke of her brush is an expression of a discerning and ridiculously gifted brain, and somewhere in this equation she, and many of her European contemporaries avoid the sentimentality that so often accompanies North American picture books leftover bran flakes stuck to the side of a cereal bowl. Waiting for Winter could easily have gone in this stereotypical direction. 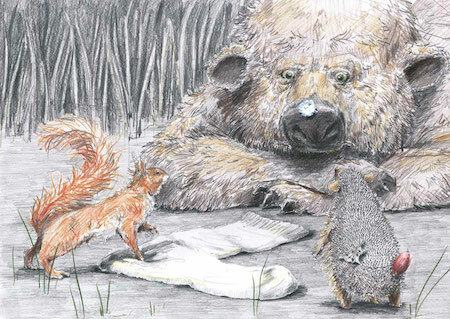 It involves a squirrel, a hedgehog (with a seed pod stuck to his back) and a bear – a trinity of cute, but Meschenmoser’s style and storytelling abilities deftly navigate the usual traps of this type of picture book. As the title suggests, the characters are literally waiting for winter, or at least the first snowflake, which none of them have ever seen. The squirrel initiates the vigil, coercing first the hedgehog and then the bear into waiting with him. All three are hibernators, and dead tired, and the way Meschenmoser conveys their sleepy eyes and bed-head fur is so charming and so gently humourous, the book is…well, simply irresistible (to quote Robert Palmer). When the hedgehog pops his head out from under a pile of hastily sketched leaves, you can almost hear the crunch and rustle of fall foliage. The trio sing sea shanties to keep themselves awake, and in their bewildered states, mistake various items like a tin can and an old sock for snowflakes. When the snow finally arrives, the drawings become thicker, more detailed, but the individual lines retain their fluid loveliness. Winter blue replaces autumn gold, and the effect is thrilling. The change has come. Yes, the characters in Waiting For Winter are cute, but they are also beautifully unique, realized on the page in quick and dramatic pencil strokes against simple backgrounds. At first glance, the drawings seem messy, but at the same time, skillfully rendered, like a Stephen Gammell illustration in a subdued palette. The typeface is perhaps too large, too harsh, and too black for the sketchy quality of the illustrations, but this is a minor point in an otherwise exceptionally beguiling picture book.